The basic facts are these. The Spring Classics are a series of one day bike races in Europe. They are held at roughly the same time and on the same course each year. Some have long traditions, others are quite recent. Many have nicknames and they are clumped together in various ways – for example the 5 most famous are known as The Monuments. Many routes have quirky details – such as cobble stones, gravel sectors, very steep climbs or sudden constrictions where the riders have to funnel onto a narrow road. Sometimes many of these quirky details occur together! But that’s not the half of it. The real story of the Classics is the obsession of the local populations for these races. Whole regions shut down and locals flock to their favourite vantage points every year. Alcohol is involved. In short, it’s their Melbourne Cup. From a fantasy cycling perspective the Classics are a good option for people who haven’t played before. The fantasy competition will include 13 races. The races are usually several days apart so players have time to manage their teams. The Classics don’t have the continuous Friday scramble feeling of a grand tour, where players are trading every day. For Australians – SBS will broadcasting the 5 monuments live – so you get to fistpump or yell at your riders depending on how they are performing. Other races should be on Eurosport or perhaps a livestream. I will provide more info on live race broadcasts in the preview before each race. What if I don’t know anything about these races? The game is open now. Click on the link and register to play. The code for the DTTalk ProCycling League is 75482, this is a private league but any number of players can ask to join. If you read these articles you should join and support the DTTalk league. If we get enough players I hope to get a sponsor to provide a prize for future competitions. Players pick 8 riders for each race within a 150 credit salary cap. You can make 50 trades for the whole 13 races. There are not enough trades for substantial changes before each race. The best strategy will be a conservative one of holding riders likely to do reasonably well in a series of similar races, thereby conserve trades to use when the following races are quite different and you need a different type of rider. The scoring system is shown below. The aim of the game is pretty simple … pick riders who will finish as near to the front as possible. Join up if you like cycling and want to enjoy these races. We will be providing information about key riders and selection and trade recommendations before every race. The gap between the races provides enough time to post articles and encourage discussion. If you read these and follow the advice you will have a competitive team. Hopefully there will be good discussion in the comments section as well. Het Niewsblad is a Belgian newspaper; it translates as “The Newspaper” in English. They sponsor the epic Tour of Flanders (Classic no. 7). In 1945 a rival newspaper Het Volk (“The People”) started a rival bike race that they called Omloop Het Volk – where omloop means loop or circuit. Eventually Het Volk met hard times and was bought out by Het Niewsblad, who then renamed the race after themselves – Omloop Het Niewsblad. Many of the classics have their name translated into english, that never happens for OHN because “the newspaper circuit” would sound lame. 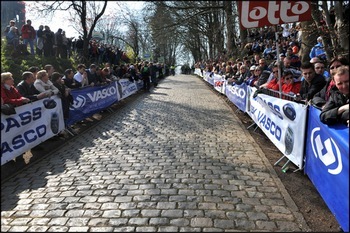 The race is in the East Flanders region of Belgium which means one thing .. lots of cobbles, in fact short cobble climbs. It is the first race of the season in Belgium and is often beset by very cold weather. The race starts and finishes in Gent (i.e. an omloop); the profile is below. First up a race for the strong men – bigger bodied cobble riders who can ride in the lead selection all race, get over a series of short sharp climbs, and then launch an attack at the end. Last year’s first five are good examples – Stannard, Van Avermaet, Boasson Hagen, Vanmarcke, Terpstra. 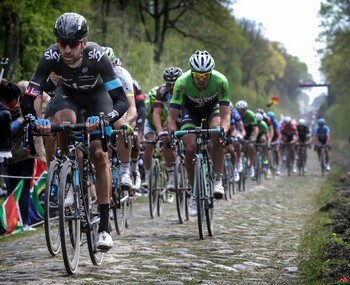 Category – cobbled classics, the season openers. Double vowells in the name usually indicates Flanders and therefore cobbles. This is the second race of the Belgian opening weekend – it’s still very cold. The race starts in Kuurne goes toward Brussells and comes back Kuurne. The race organisers are trying to talk it up with their poster on the right. However, it is an easier race than OHN … less hills and the last 50km are flat. KBK is more likely to have a larger selection at the end and even a sprint finish. Last year’s first 5 were Boonen, Hofland, Vanmarcke, Lampaert and Vandenbergh. After only 8 years, the Strade Bianche is more a phenomenon than a classic. Inspired by the L’Eroica community event for vintage cycling, and described as the most beautiful race in the world, the name translates as “white roads”, meaning unsealed roads. The race goes through the rolling chianti region of northern Tuscany and includes many gravel sections. It finishes in Siena with a 16% climb through a narrow medieval laneway to emerge at the campo piazza, home of the palio horserace. It is a spectacular race. Some hard climbs toward the finish make this race more suited to GC and grand tour riders than classic specialists. The first 5 last year were Kwiatkowski, Sagan, Valverde, Cunego, Kreuziger. Cadel Evans finished 7th. Category – doesn’t really fit anywhere, but not to be missed. Scramble factor (days after previous race) – 6 days, but will need a lot of trades. 4. Milan-San Remo (Italy, Sunday 22 March) – 293km !! Now we are getting serious. This is world tour level at the highest category – a monument. This is the first really big race of the year. It started in 1907 and at 293km it is the longest major race. It’s very long, it takes 7 hours. It’s mostly flat and sprinters often set themselves for this as their best chance for a monument. The route goes from Milan, south to the Italian riviera and then follows the coast to San Remo. However sprinters plans are often upset by two things. Firstly, the weather, if it is cold then riding 7 hours in the cold culls a lot of riders along the way. Secondly, two pesky climbs in the last 50km – the famous cipressa and poggio. These climbs provide opportunity for anyone who doesn’t fancy a sprint finish to launch an attack. The final 50km is always riveting viewing because the result is so uncertain. Last year was cold and it rained all race. 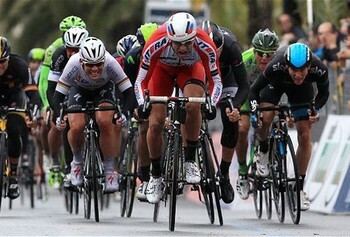 A select group of 25 finished at the front; the first five were Kristoff, Cancellara, Swift, Lobato and Cavendish. Scramble factor (days after previous race) – 15 days, but will need a lot of trades after strade bianche. After 2 races in Italy we’re back in Belgium for what some people call the first of the real cobbled classics. E3H starts a huge week in Belgian cycling and is the last practice run before the more prestigious Gent-Wevelgem and the Tour of Flanders later in the week. The big story of this race is the bizarre marketing moves from the organisers. It used to be Harelbeke-Antwerp-Harelbeke, a race between those 2 cities and return. Then in the 1960s they renamed it after the highway (E3) just opened between the 2 cities. However, that highway is now called the A14, so E3 is a meaningless name for an old road. Then more recently they have tried to promote the race with a series of sexist posters. What are they smoking in Harelbeke? The last half of the race includes many short steep cobble climbs and it is a good form guide to the rest of the week in Flanders. Last year the first five were Sagan, Terpstra, Thomas, Vandenbergh, Vanmarcke. Scramble factor (days after previous race) – 5 days. Will need a lot of trades after MSR. After changing dates a view times GW is now positioned as a leadup to the Tour of Flanders. Although GW is a race that gives more hope to sprinters with it’s long flat finish. GW is the biggest race in West Flanders and sprinters have to negotiate two trials if they want to be at the finish. Firstly, the race heads out towards the Belgian North Sea coast and is often effected by cross winds splitting up the riders. Secondly, a series of sharp steep climbs, including the famous Kemmelberg twice. Last year there was a lead group of 28; the first five were Degenkolb, Demare, Sagan, Vanmarcke, Boonen. Scramble factor (days after previous race) – 2 days. In Belgium, La Ronde is like the Oscars, Tour de France and the Superbowl rolled into one. 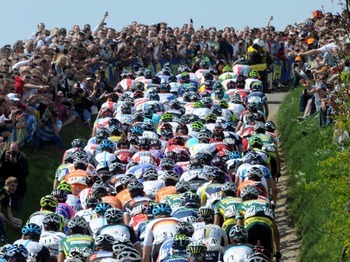 The race is also referred to as the Tour of Flanders (it’s english translation). However, it is not a tour stage race, there is only 1 day. A win here is said to be the most impressive a rider can have on his resume because you have to be a true all-rounder to win this. Pure sprinters get dropped on the climbs, while pure climbers get beaten up in the cross-winds on the flat sections. Two famous climbs are worth mentioning here – the notorious steep and narrow Koppenberg where some riders have to walk if it is wet, and the Paterberg which is usually near the end and can be a launching point for a final attack. Last year the first five were Cancellara, Van Avermaet, Vanmarcke, Vandenbergh, Kristoff. Category – Monument, cobbled classic. Scramble factor (days after previous race) – 7 days. This race is flat and in Antwerp province; there are some cobbled sectors. It is usually won by sprinters. Last year the first five were Kittel, Farrar, D. Van Poppel, Petacchi, Bennett. At present I don’t know much more about this race, but it isn’t on for 5 weeks. There probably isn’t much that is important at this stage other than it is a flat sprinter’s race. Category – semi-classic, if there is such a thing. What to call it to sound like you’re an expert – ?? Scramble factor (days after previous race) – 4 days. Will need a lot of trades. This race is flat and heads north from Paris to Roubaix in northern France. It includes 25-31 cobble sectors in various conditions. The weather makes a big difference to this race, there are a lot more crashes when it is wet. As a quirk the race finishes with a lap of the Roubaix velodrome. It is an endurance test and is usually ridden from the front as a war of attrition. Last year the first five were Terpstra, Degenkolb, Cancellara, Vanmarcke and Stybar. This race translates at the Brabante Arrow. This race is similar to coming hilly races in the Ardennes so it is often used by riders intending to race in the Ardennes Classics as a final practice run. So form here is a good guide to those races. Last year the first five were Gilbert, Matthews, Gallopin, Geschke, Leukemans. Scramble factor (days after previous race) – 3 days. Will need a lot of trades. So we leave Northern Belgium and the cobbles and head into the dense forest and mountains of the Ardennes region for the final three races. We start in the Netherlands with their biggest race of the year – the Amstel Gold – with a brewery the major sponsor fuelling the already rabid fans. There are 31 short steep hills to be climbed, the last 2 being the most important – the Keutenberg (20%) and then the Cauberg. Expect to see the same names here as in a medium mountain stage of a grand tour. Last year the first five were Gilbert, Vanendert, Gerrans, Valverde, Kwiatkowski. Scramble factor (days after previous race) – 4 days. Will need some trades. Back in Belgium but a similar race – with a similar field. Although some riders sit out this race to focus on LBL. There are lots of climbs but it’s really all about the famous Mur (meaning wall). The Mur de Huy is 1.3km and averages 10%, with sections of over 20%. The riders have to climb it 3 times, including just before the finish. Last year the first five were Valverde, Martin, Kwiatkowski, Mollema, Slagter. Scramble factor (days after previous race) – 4 days. The final of the spring classics is also the oldest. La Doyenne (the old lady) was first run in 1892. LBL is an endurance test that suits grand tour riders. The climbs are longer and have more constant gradients than many of the other classics. 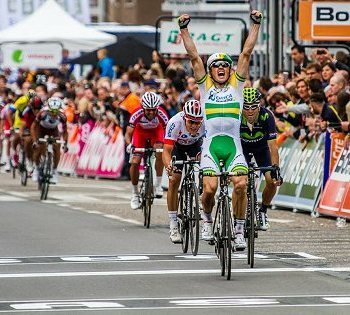 Last year the race was won by Australian Simon Gerrans. The first five were Gerrans, Valverde, Kwiatkowski, Caruso, Pozzovivo. Category – Monument, Ardennes Classic. Scramble factor (days after previous race) – 3 days. Whatever trades you have left. The total trades of 50 allow for 4 trades in each of the next 12 races, with 2 trades spare. 1 – OHN – pick team for first 2 races, cobble specialists. 3 – Strade Bianche – a lot of trades, bring in GC, medium mountain riders (6). 8 – Scheldepris – lot of trades if you have them, bring in sprinters (6). 10 – DBP – lot of trades, medium mountain stage riders (6). 13 – LBL – refine team, use all trades left (2). This spread uses 47 trades, so there are still 3 extra trades to be used for unforeseen events. It is tempting to allocate more trades to more famous races – for example skip Scheldepris and hold more of your cobble specialist team for Paris-Roubaix, thereby saving trades. However, placings in all races are worth the same amount of fantasy points so that is the wrong strategy here. A smaller sprinter’s race like Scheldepris will probably be easier to pick than the charging mayhem of a wet Paris-Roubaix. Another factor that is important is the scoring pattern (table repeated from above). There are a number of ways to score points, including finishing in the first 20 places. However, a large proportion of points go to the first 5 places. Ignoring ‘lucky’ bonuses for breakaway and team victories – there are 301 total points available per race. However, almost 40% of points available go to first 3 placegetters, and 55% of points available go to first 5 placegetters. My target score for my team for this competition is over 100 points per race. To do this I probably need 4 riders every race who have a good chance of finishing on the podium (not just in the first 20). Further all riders in my team should be able to get two thirds of their value in points every race. This suggests a strategy of using trades to rotate elite expensive riders depending on the race, and then selecting cheaper riders who are likely to compete in a lot of races and jag a few lower level points every now and then. It is a fairly obvious strategy, but given the way the game is set up with scoring and limited trades I don’t think there is any other option. Now to start picking riders. 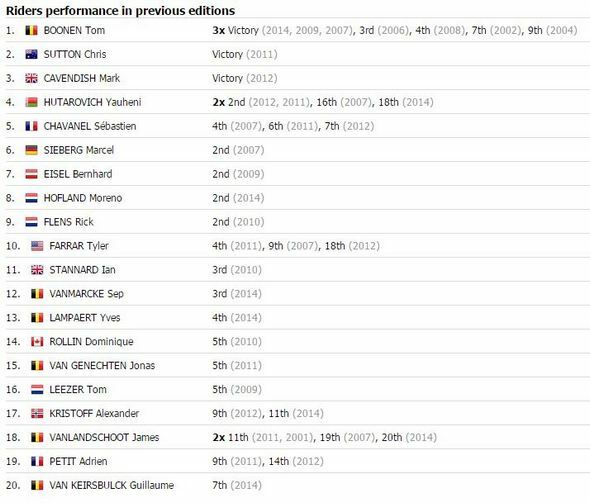 Below is a table of the 20 Omloop riders with the best previous form in that race (table from procyclingstats.com). Similarly a table of the 20 KBK riders with the best previous form in that race. (table from procyclingstats.com). Team Etixx-Quickstep have the strongest cobble team and will work together to get their riders onto the podium. They have 4 very competitive riders for OHN – Boonen, Terpstra, Stybar and Vandenbergh – but we can only pick 2 riders from any team. 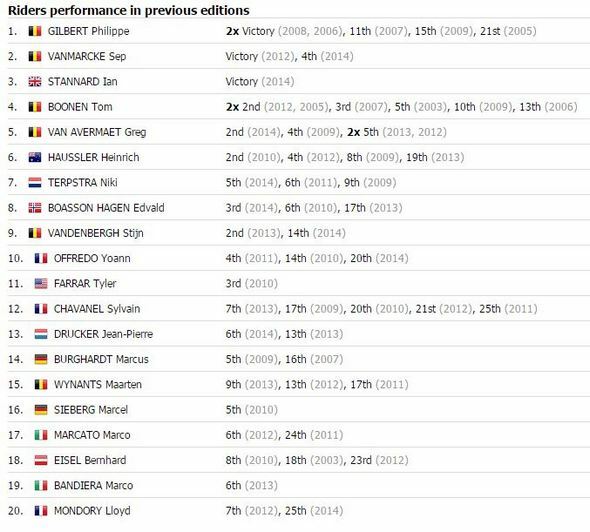 They are all similar value but Stybar is on the startlist for the first 4 races, Boonen for the first 2 and has the best record, while Terpstra and Vandenbergh are only listed for Omloop (of the first 4). So that locks in Boonen and Stybar for me. However, it also means Cavendish isn’t an option to trade in for race 2. The only other riders listed doing all of the first 4 races are Greg Van Avermaet (29.5) and Martin Tjallingii (9.5). GVA is in good form and was second in the Omloop last year – so he is probably a lock as well. The next lock is Sep Vanmarcke (24.9), he doesn’t win many races, particularly now he is watched so closely. However, he should go close to averaging 25 points for every cobbled race which is worth having in my team. Kristoff should be considered as he is doing OHN, KBK and MSR, but at 31.9 he is expensive. Time to look at some much cheaper options. Tjallingii (9.5) is one option because he is in all 4 races. Others who have form to finish in first the 20 are Luke Rowe (8.6), Jempy Drucker (12.3) – who finished 6th last year, Waeytens (11.0), Lukemans (12.0) and Marcato (12.3), Wallays (11.3), Boasson Hagen (13.1), Sebastian Chavanel (7.6), Ladagnous (5.0), Offredo (4.5). I’m using OHM as form guide for KBK. I have parked enough cash to upgrade someone to a good sprinter if I decide to make 1 trade for KBK. That’s it for now. Register with road.cc, join the game, join the DTTalk ProCycling League (code 75482) and start planning your team. Lockout for the first race is 8am Saturday 28th UK time, or 7pm Saturday evening AESST. I updated the post with guide to starting team. Race starts approx 9:30pm AESST, finishes 5 hours later approx 2:30am. They will have a link to a live ticker commentary going (in various languages). Then eventually they usually post links to live video streams of the race once the broadcasts start in various parts of the world. Also follow on twitter under the hashtags #OHN or #omloophetnieuwsblad. The official race twitter account is @OmloopHNB although I suspect many of their tweets will be in dutch. I loves me the grand tours & one day classics religiously sitting and watching them all on a nightly basis. Never tried to cycling fantasy tho, you may have inspired me to give it a shot. Thanks, hope you got your team in on time for first race. Even if you didn’t you can still join for remaining races. I’m feeling a bit like Etixx Quickstep today … somehow that race didn’t go to plan and I really should have done better. Anyway another race tonight, then a break to next Saturday till the next race. Lockout for Kuurne-Bruxelle-Kuurne is 7pm AESST tonight. Also we have been given 5 extra trades, so limit is now 55 trades in total. The extra ones were to compensate for a pricing glitch in some of the riders. K-B-K Race starts approx 10:00pm AESST, finishes 4.5 hours later approx 2:30am. Also follow on twitter under the hashtags #KBK. The official race twitter account is @KuurneBxlKuurne although I suspect many of their tweets will be in dutch. Next race is Saturday – I’m really looking forward to Strade Bianche, and will blow my broadband allowance with a livestream so I can watch. The early startlist is here … it won’t be fully populated until nearly the end of the week. My next strategy article will probably be Friday … when the full startlist and weather forecast is known. Expect to trade in some big names to your team – but they will be expensive.